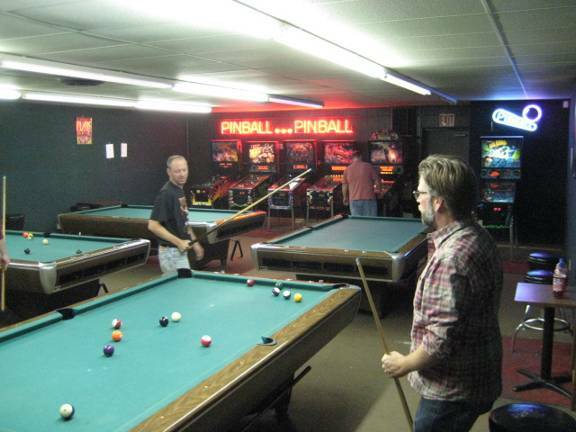 On October 2nd 2002, SS Billiards in Hopkins, MN, USA held its 30th anniversary party - called Bolshoi Goose. Unlike last year, this year Lloyd held his anniversary party on the actual anniversary date - 20th September. This free and fun party lasted from about 5pm until a little after 11pm. 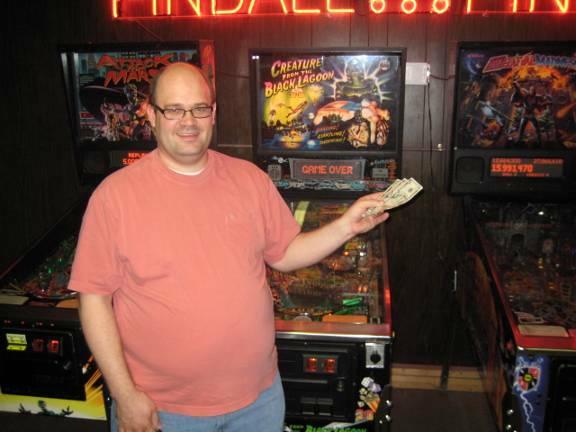 Lloyd was responsible for funding and organizing the pinball party. 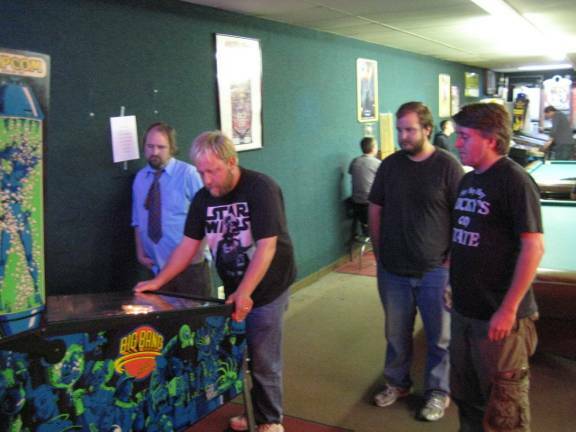 Dave offered to help Lloyd by running the pinball tournament. 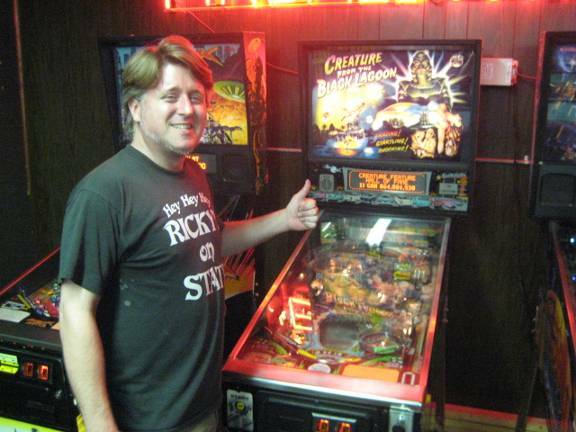 The week before Lloyd's 38th anniversary, he sent out an e-mail announcement of upcoming pinball events. Below is a copy of that e-mail. Plan to stop by now and enjoy the fun. 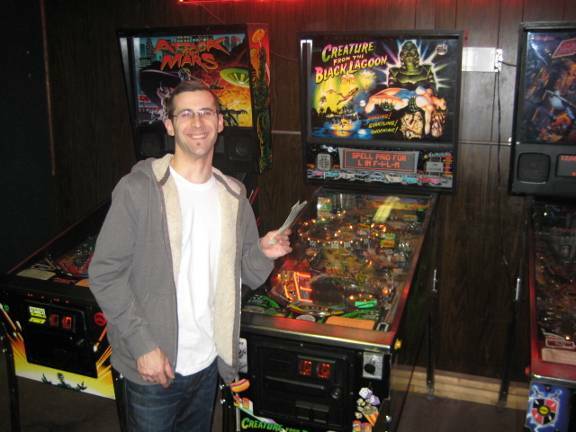 Famous Dave's ribs at 7pm, followed by a pinball tournament. A special thank you to all who helped make this happen ! Last nights Crazy Joe Esposito Pinball Event was a lot of fun and great food. 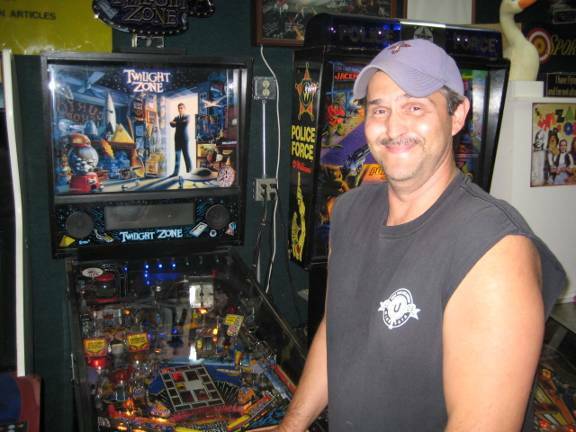 Next Crazy Joe Esposito Pinball Event will be on October 13th. 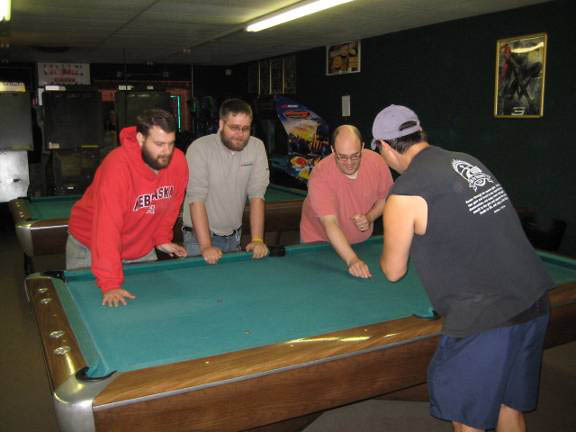 SS Billiards is currently running two TOPS tournaments. And open 360 days a year for your pinball enjoyment. Lloyd also made a post on R.G.P. Below are copies of his sixth draft (not sent) and of his actual public post. Even though it's so long ago, I think about it and it seems like yesterday. Unlocking the door, stepping in. Full of hopes and dreams. Later today I'll go in and open up. Not much planned. Mostly a normal day. 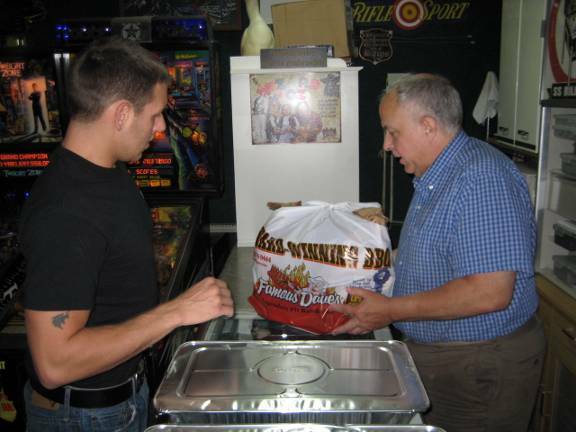 7pm Famous Dave's ribs show up and a pinball tournament after the food. 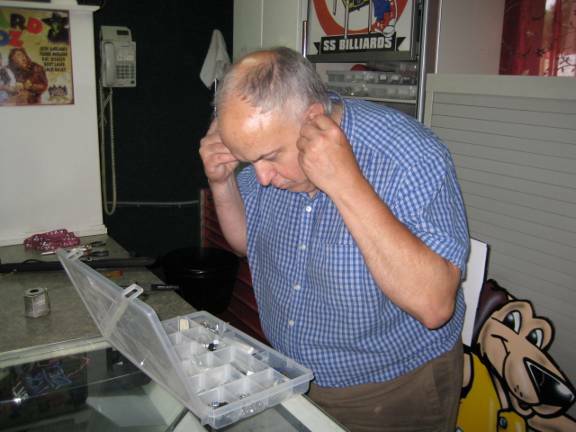 To mark my 39th Anniversary with SS Billiards. 39 years. It really sounds like a lot. Of course I have about a half century in the industry. Since my 38th anniversary post. It seems more things didn't pan out than things that did. I was hoping the economy would start coming around in the fourth quarter. And when that didn't happen. The year ended on kind of a sour note. Game Room magazine closed in November, there went my technical editor job. December really blew chunks with three bad weekend Winter storms. I got snowed in and slept out there twice. First time ever. First time in thirty five years I was open New year's Eve. A bunch of pinheads wanted to spend the evening playing pinball, so I gave up my day off and was open. Of all things Mike Pacak called and wanted to be sure I'd be back for the LTG :) Show next year. So the evening was fun. 2011 started off good. Had my annual New Year's Day pinball tournaments. Right when the pinball tournament was supposed to start Jack Guarnieri calls and talked about the Wizard Of Oz. The cat was out of the bag. With Chuck's Spooky Podcast that day and Jack's interview. I told him I hope to see him at Expo. And he thought he may see me sooner with my Wizard of Oz machine. So the talk of me testing one seemed alive. So 2011 was off to a start full of hope and cheer. Sadly it has been kind of bland year so far. Some of the things I'd hoped to accomplish were held up by the economy. I still need to find felt and recover the pool tables. Still need a new rug. And losing the Neotec monitor battle. Three dead right now. 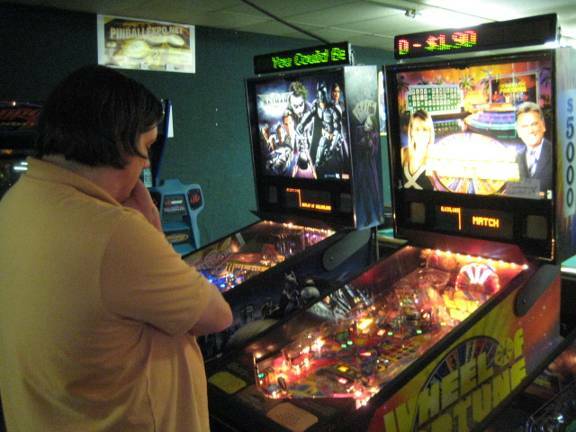 The pinball panel at Midwest Gaming Classic didn't work out so I missed that show. Tournament. 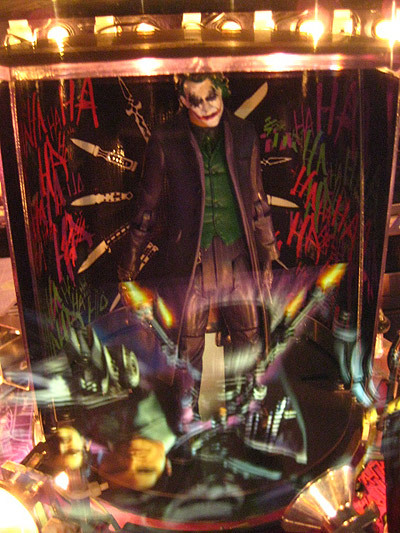 And a smattering of Crazy Joe Esposito Pinball Events, Pinball Picnics, and Launch Those Geese events. And I started the Universal Player Yearly Organized United Ranking System http://www.upyours.info/ to track and reward regular participants in my events. 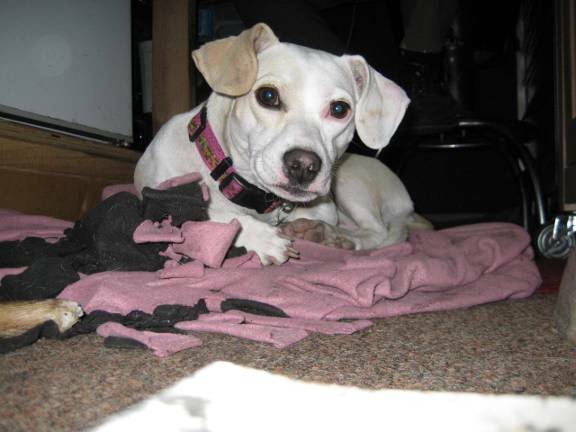 There was the addition May 8th of Prada, the sweetest little dog ever, she started working daily in my human resources department. Coming up the Fall Pinball Circus ( http://www.pinballcircus.com/ ), The LTG :) Show at Expo ( http://www.pinballexpo.net/ ) and the Friday After Thanksgiving Pinball Tournaments. So once again after the lights go out tonight. And I'll have some coffee and check RGP and other places to see if anyone needs any pinball help before I go home. I'll be thinking of the coming year as I head towards my 40th Anniversary. A new chance and a new start filled with hopes and dreams, things I hope to accomplish, things I hope happen, and all that is pinball. Mark your calendars now for September 20th 2012. For the Ruby Goose Party. A one day free event similar to the early Goose parties to give thanks to all who helped make this possible. In closing I want to say Thank You to all who have helped get things this far. 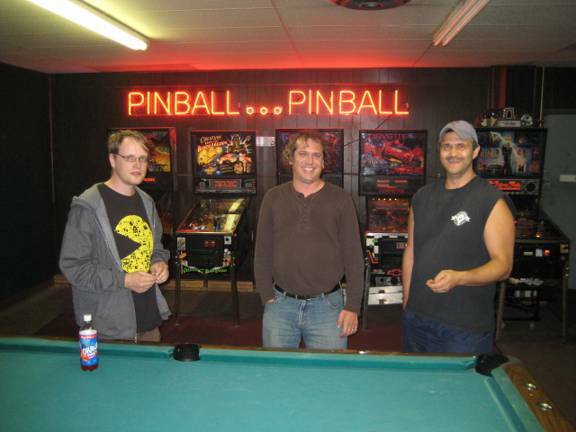 The list is long and from many parts of the pinball community. Manufacturers, distributors, operators, friends, customers, and people that are traveling and make it a point to stop in and say hi. Thank you doesn't seem nearly enough, it comes from the heart. 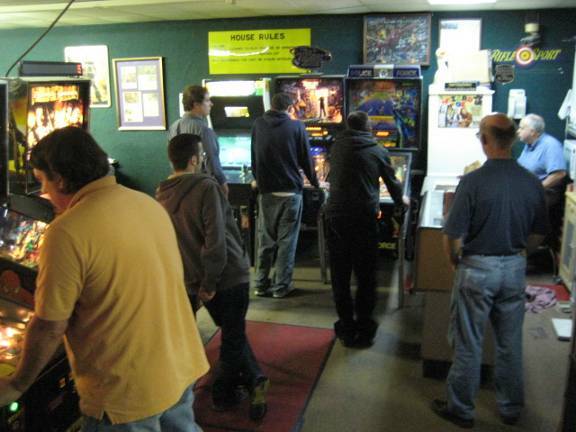 Thank you to all who have helped keep SS Billiards going and the machine that is pinball alive ! Once again I sit wondering if I should make an anniversary post. I've been working on writing one. This is the seventh version. Quite unlike the previous 6, which were similar, just cleaned up. It's hard to not think back on the evening of September 19th, 1972. When the Hopkins City council approved the license transfer to my Mother. Who bought SS Billiards with my help. And ran it until she retired in 1979 and sold me her interests, and helped run it until her health weakened and she didn't work past late October 1987. SS Billiards was around for a year and three fourths when we bought it. 39 years passes so quickly. Yet as I think about it, it seems like only yesterday. I remember driving out and walking up and unlocking the door. Going inside. To face an uncertain future. Full of hopes and dreams. Time passes. The world revolves and keeps changing. Yet somehow SS Billiards seems anchored in time. Things have evolved inside, the names and faces of the customers keeps changing. 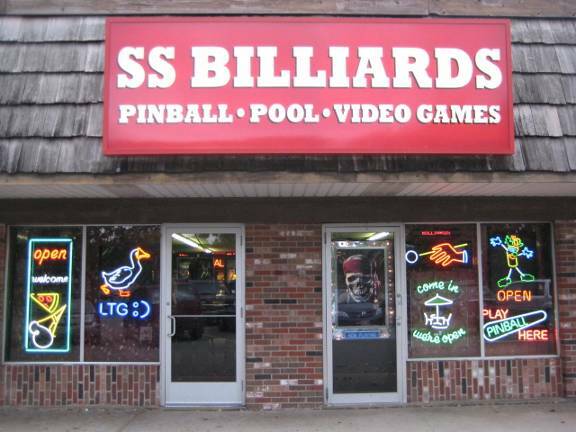 And people constantly stop in, to be sure SS Billiards is still there. That I am still there. That there is one thing they can count on in their lives. That is really precious. There isn't too many places on the planet like that. I have spent over a half century in the coin op industry. It is those 39 years that define even me. And pinball has walked hand in hand with me. When I bought my first game. It was a brand new Gottlieb Pinball Pool. 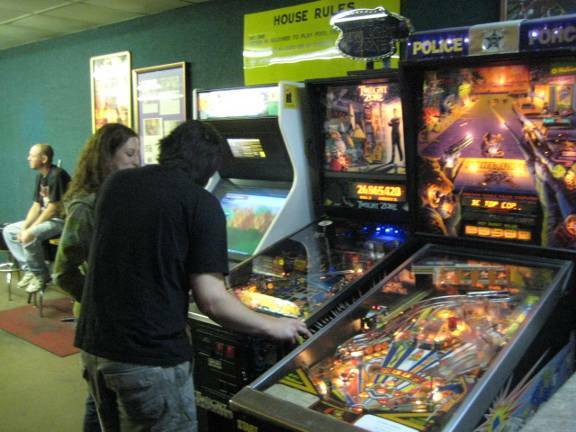 When the video fad bubble burst, it was pinball and pool that saw us through the tough years. Even now, as the industry has all but died. Pinball keeps me limping along. Struggling the good fight. Waiting patiently for all things to start rolling in a positive fashion. Later today. I will go to work. Most likely early. Not too much planned for this year. Famous Dave's ribs at 7pm and a pinball tournament. A little something to mark the day. And as I approach the door, unlock it and go inside. I will be thinking of the future with hopes and dreams. It is times like these that I reflect on how rich and blessed my life has been. I am grateful. Thank you hardly seems enough. It comes from my heart. Thank you to every person I've encountered because of SS Billiards and pinball. You've helped me live a life very few will ever know. Again this year, there was no fancy set-up. Lloyd's arcade was left as normal. There was no special set-up, but there was a special new presence at SS Billiards - Prada. Lloyd ordered pork ribs from Famous Dave’s and the food arrived at very close to 6pm. Someone from the crowd told the delivery guy to, “Just put those in my car”, to which the delivery person answered a flat and contemptuous, “No!”. For both tournaments, competitors played their games in the order they were drawn. Contestants seemed to prefer deciding player order by flip-of-a-coin. Dave ran a single-elimination tournament but there was a twist. One of the names from the first round’s losers was redrawn. That one person’s name (yours truly) was put back into the tournament. Other than that one twist, the 'Survivor' pinball tournament was ordinary luck-of-the-draw where everyone drew a player's name. Dave took the names in the order in which they were drawn and placed them in groups of three. 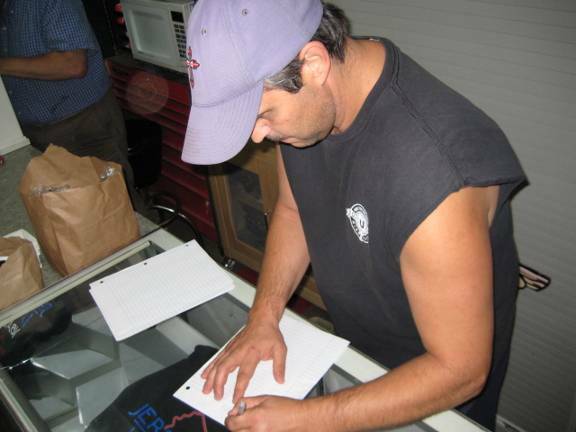 The groups were then assigned, in order of draw, to machines which Dave had already drawn. Like the previous anniversary party, all of Lloyd’s games were available and on coin-play, both before and during the tournaments. Like last year, there were three winners this year. As mentioned above, two tournaments were held this year. After a long day of work, Joe was finally able to attend the party. As Joe made the effort to attend, Dave made the extra effort too and offered to run a single elimination tournament. Just for fun, the boys each threw one dollar into the tiny jackpot.